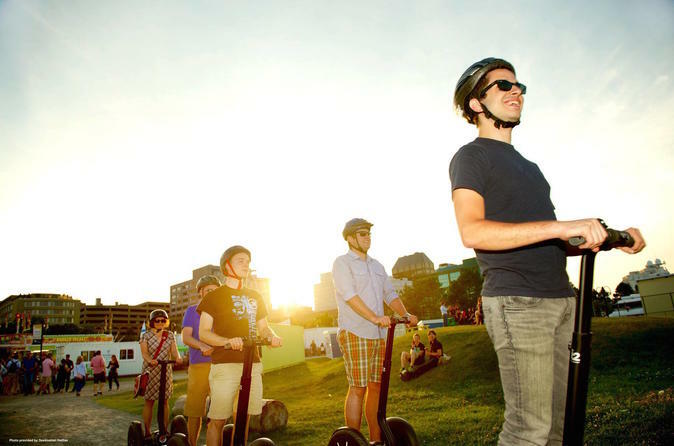 See and learn about the beautiful and historic sites of Halifax during this guided 2.5-hour Segway tour. Your friendly guide will take you by some of Halifax's most popular landmarks, including the Halifax Waterfront, the Public Gardens, the Halifax Citadel National Historic Site, Argyle Street, and Grand Parade Square. Choose from one of two departure times daily when you book. You will then follow an expert guide along the Halifax Waterfront Boardwalk, where you will have a chance to take pictures and stretch your legs during your first short stop near the Halifax Seaport. Next you'll head into the city passing by Government House, the Old Burying Ground (second short stop), St. Mary's Cathedral Basilica, and the Halifax Central Library. From there you'll glide through Victoria Park on your way to the Halifax Public Gardens and your third stop (10 minutes). Public washrooms are available here. Your tour continues up to Citadel Hill and the Halifax Citadel National Historic Site, where you will get your best views of Halifax and the surrounding area. Here you will enjoy your fourth stop (10 minutes), and another opportunity for some great pictures. Next you'll take a ride along Halifax's Argyle Street on your way to Grand Parade Square. Finally you will make your way back to the Halifax Waterfront passing by Province House, the Maritime Museum of the Atlantic, CSS Acadia, and HMCS Sackville - a fitting finale to this revealing tour of Halifax.